I am not sure whether it is really worth giving the 10-minute short The House I Live In a rating as it is not something one can really grade. The only reason I sat down with this quickie is because I’m such a Frank Sinatra fan that, naturally, I need to indulge in any chance I can get to see his work. Sinatra plays himself as we open on a scene of him recording a song in a studio before he takes a smoke break and wanders out to an alley. There he finds a group of boys who have chased another kid into a corner and clearly plan to give him a beating. Sinatra intervenes and learns the outcast is disliked purely for his (unnamed) religion. The crooner proceeds to tell the boys they are Nazis because only Nazis care about a person’s religion. Sinatra sort of proceeds to call the bullies jerks and other names before heading back to work, which prompts his singing to the boys of “The House I Live In,” a ditty about all the things that make America what it is, most especially the people. The short won a Special Oscar for Best Tolerance Short Subject –seriously– and a Golden Globe as Best Film for Promoting International Good Will. It was among the many patriotic films being pumped out by studios during the war to promote America’s allies and the cohesiveness of the country’s people. In 2007, it was selected for preservation in the United States National Film Registry by the Library of Congress as being “culturally, historically, or aesthetically significant”. Curiously, The House I Live In writer Albert Maltz would later be blacklisted during the McCarthy era as was Composer Earl Robinson, who wrote the title song. 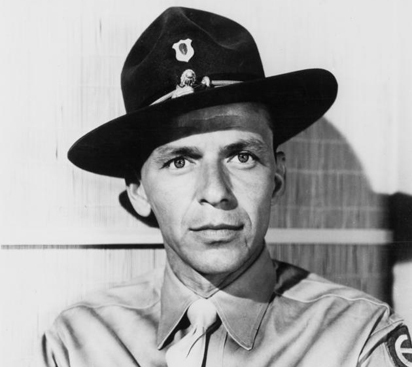 Sinatra comes off as harsh when disparaging the boys, which really sends a broader message to the public in general about picking on those who are different. If only celebrities today would make TV spots calling homophobes and those who think all muslims are all terrorists a bunch of assholes. I am being a bit facetious, but perhaps we can learn by Sinatra’s message and song of tolerance as the world never seems to be without its prejudices. it is an interesting piece for several reasons. The use of the word “Japs” in it seems a bit ironic. Also, Sinatra, perhaps not at that point, but soon afterward, became enamored with the Mafia, so much so that he was denied a gambling license by the State of Nevada. I guess that the house he lived in had room for gangsters, but no Japs. The “Japs” usage was strange. Sinatra talks about how great it was that an American Protestant and and American Jew were able to bomb a Jap battleship after Pearl Harbor. It seems the only group he/the writer thought Americans should not tolerate were the Japanese. The word “Jap” is not a racist term…though it isn’t really PC by today’s standards, it was common to call people by a shortened version of their nationality: Brits, Aussies, Kiwis, Froggies, Swedes, etc. BTW, good point about this film winning a special honor regarding tolerance and then a few years later Maltz finding himself on the blacklist. A tad bit hypocritical, to say the least.